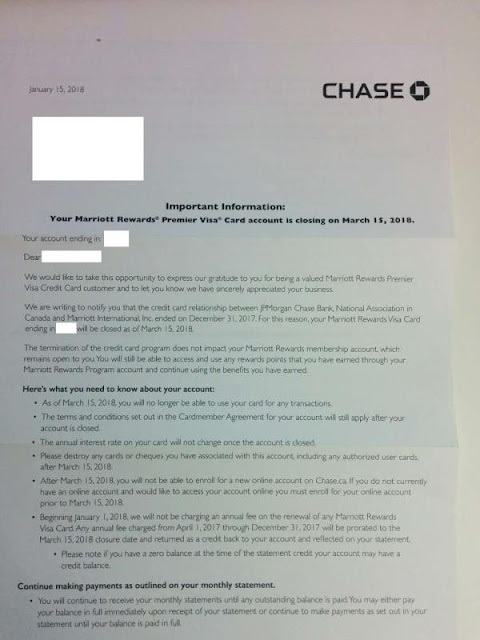 The credit card relationship between Canada JPMorgan Chase Bank, N.A. and Amazon.ca is ending and Chase will be closing the Marriott/Amazon Visa Card program as of March 15, 2018. Any outstanding points earned as of that date will be transferred to the Marriott account and the card will stop working. Any earned Amazon points as a statement credit as of March 15 as well and the account will be closed. BTW, even though some people's anniversaries may be after Mar 15, all Chase Canada Marriott credit card holders will receive their free night certificates as well as the elite nights for having the credit card to go toward their respective statuses around 14th of March. So, I suggest the Chase Marriott card holders should keep this card until it is closed by Chase. And you should also get the pro-rated annual fee rebates from Chase as well.